Grumbling Grace: Fitness Friday. 21 Day Fix Update. Sort of. If I say "Fitness Friday," will it just be true? I know I've posted this video approximately forty times, but I still love it. Maybe you can relate to the wearing of activewear for important things like SLEEPING or DOING LAUNDRY. It's ridiculous, but I get it... Not the activewear as fashion, but waking up in the morning and putting it on, because WEARING activewear is the first step to BEING active. Right? Wrong. How many times have I rolled out of bed, put on my workout clothes, thrown my hair up in a bun, and then not worked out ALL DAY? That, my friends, is why all the moms are getting groceries in their activewear. the toddler set the house on fire. the iPhone alert for the appointment in 10 minutes went off. they were cooking supper when the toddler emptied the vegetable oil. And suddenly it's 10:30 pm and we're all lying facedown on the couch in our activewear. Recently, a fellow blogger, Emily (check her out here!) posted a link to this article by James Clear: The Akrasia Effect: Why We Don’t Follow Through on What We Set Out to Do (And What to Do About It). Desire to change future self but huge issues following through? Check. Inability to stay motivated and wait for delayed gratification? What is this word "de-layed"? Check. What does this have to do with the 21 Day Fix? I think you've already made the leap. Apart from this last stellar week of exercising because THE BEACH IN A WEEK, it's been a pretty inconsistent month in the "eating well and exercising" department. And in the mom department. Even with the beach coming up, I'm not *exactly* motivated to work out every evening. Thank goodness for accountability. I think she bought it. As a lifelong procrastinator, I've always flown by the seat of my pants. I finished the assignment just before the deadline and got ready in the last five minutes before leaving the house. Now I teach teenage procrastinators and I just want to shake them by the shoulders while screaming coffee breath into their faces, "FIGURE THIS OUT NOW! DON'T BE ME!!" This approach, like my coffee breath, STINKS for the rest of life. When I'm working, I make sensible decisions like going to bed at a consistent time, preparing my food the day before, scheduling time for chores, and actively engaging with my family. At home on maternity leave, I find it difficult to remember that being a mom is the most important job I'll ever have. I know it's true. I just struggle developing and sticking to a day-to-day structure for it all. Plan ahead and break down your goal activities into small and easy chunks to complete as possible and you might actually do them. Reducing the friction of starting. Starting the activity is more important than how well you're doing it. Start small. JUST START. As any procrastinator knows, once you've STARTED the task, it is fine. It's the beginning that is so tough. Concentrate on just beginning. Write down specifics. What. When. How. Schedule it, then do it. This year, I've cut back on the amount of stuff I'm doing and I'm concentrating on doing less things BETTER. 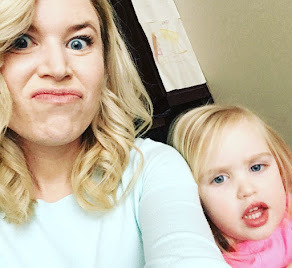 I have a routine for my kids -- wake-up, schedule, lunch, nap, bedtime-- but I didn't really have a personal routine. This week, I sat down and wrote out my own detailed daily schedule that incorporates these six areas where I want to see changes or to form consistent daily habits. Duh. *Obviously* that's what this whole post has been about. Sort of. Ish. Deciding the day before when I will work out the next day and just starting. 2. Reading my Bible and quiet time. 3. Limiting my screen time. We don't watch TV during the day, but for me, being deliberate about checking social media two or three times a day rather than scanning all day is a huge time and relationship saver. 4. Planning, preparing and eating healthy balanced meals. Writing out a weekly meal plan = success. If I skip this step, everything goes to mac and cheese. I don't know why. When I get lazy about meal prep and planning, six dollar Dairy Queen meals start seeming like a great idea. I have two vices (apart from ALL THE FOOD): shoes and books. I've culled the shoes. I'm gearing up to read my way through the books we have in the house. More on that later. None of these are earth shattering activities (I'm boring), but they are all fundamental for me to be a functioning human and to allow room for other great things to happen. I get overwhelmed by what needs to be done and the idea of STARTING is daunting. 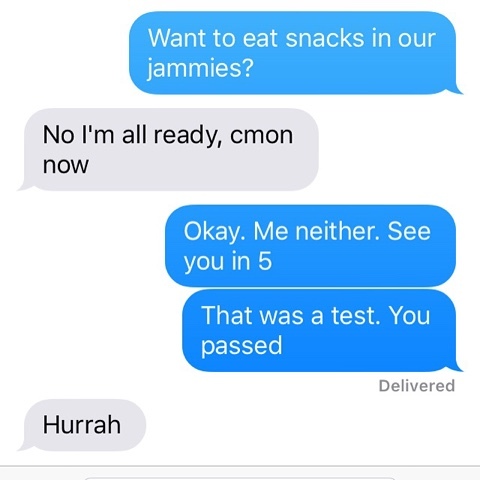 Remember that text conversation about snacking and pyjamas? I got in my car, went to my sister's house and worked out. It was just fine. It's just BEGINNING that is so difficult, as all good procrastinators know. The more intentional I am about my life, the more time, energy, creativity, and patience I seem to have. So here's to seeing the big picture. What type of person am I?? I am the type of person who works out regularly. I am the type of person who enjoys planning, cooking, and eating healthy meals. Instead of thinking of the whole task, I am committing to STARTING the tasks. We'll see how it goes. Currently, I am the type of person who has to finish a lot of laundry... in my activewear. great post! I really need to focus on my daily habits...I haven't worked out in a week :( BUT I did buy cross country skiis yesterday!!!! Yes! Awesome. Ski date soon??? I'm working on a bunch of these... exercising is one for SURE! So hard, once both kids are down I'm spent! Ditto. Oh motivation. YOU ARE SO HARD!